Announcement Welcome! ♥‿♥ Sketching goes on every day! Want to see more of my work? Come visit my flickr account and let me know if there sketches you’d like to see in my shop! Welcome! ♥‿♥ Sketching goes on every day! Want to see more of my work? A sketchbook and a simple pen – that is all you need to go on a journey every day! Hello, I'm Marina, illustrator, graphic designer, and tireless sketcher. I have loved drawing as long as I can remember. There were some periods in my life when I didn’t have proper time for my art, running between job and family. Then I decided to put a sketchbook into my bag and to draw between my daily tasks. It was difficult at the beginning, but very soon it turned into an addiction. For more than last 10 years, my sketchbook hasn't left my bag. Sketching became part of me, part of my way of experiencing my daily routine. Caring sketchbook helps me to understand that most wonderful subjects are around me, I just need to look for the stories. I'm not talking about fancy postcard views, actually - places that are too pretty usually don’t attract me. I love real live surroundings that challenge me to find beauty in ugliness and in the everyday events. Places that we pass over often can get suddenly different meaning if we look at them better. All my sketches are done on location, from direct observation. Each sketch starts from some feeling, idea, something that caused me to stop and to extract the sketchbook from my bag, something that touched or excited me in some way. 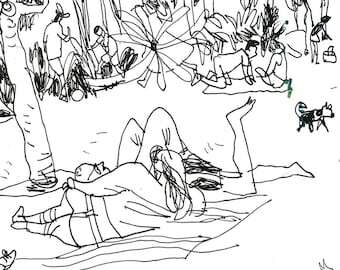 I hope my sketches allow me to share with you my feelings, to show you my excitement from a summer beach, street corner, and, of course, many different people and their stories! Please feel free to visit my instagram, blog or flickr for more recent stories and behind the scenes look!